What better way to ring in the New Year than with this white and silver arrangement? So beautiful, it promises the new year will be a great one. 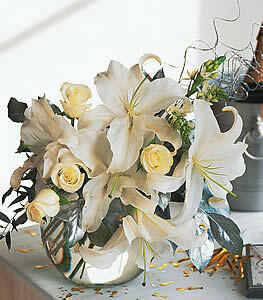 Lilies, ornithogalum and roses are delivered in a clear glass bubble bowl and accented with silver metallic ribbon.